Last weekend on Saturday, I attended the Basic Training to begin my path to be a Zumba instructor. Saturday morning saw me waking up early to get ready to go. I ate breakfast and then bundled up to go outside. The temperatures were low and discouraging but I had made a decision to go further with the Zumba classes and did not want to let myself down (added to which I had already paid for the training). After an hour and a half travel time using the public transit, I arrived at the venue to see many people milling about. I had made it just in time and rushed to get registered and changed for the lesson. We had been warned it would be physical so I was prepared to do a little dancing. The day started with a Zumba class run by the instructor. And already I was smiling 😀 The class was full of energy and so much fun to do – I can only work towards being as good as he is. After the sample class, we continued dancing – and learning. I began to see and understand the patterns that I had followed in the many Zumba classes I have attended. After lunch, we sat for a bit to talk about theory – but only for a short while. Then we were up again getting our bodies moving. It was nearing the end of the day and my body was feeling the strain: my arms were hurting, and my legs were wobbly. The training was definitely practical-based and not theory-based. 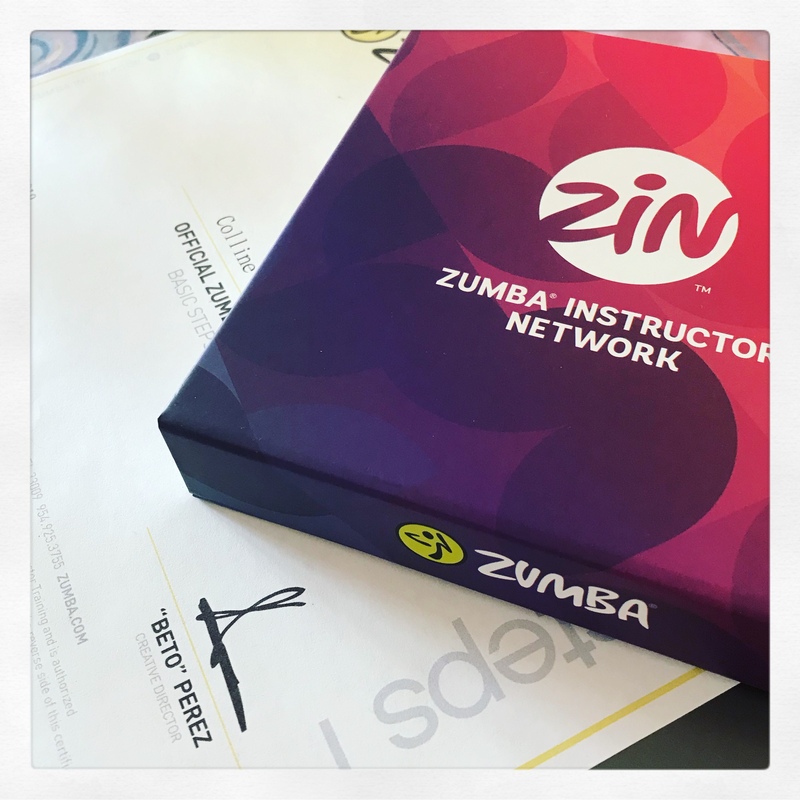 The day ended with me receiving my certificate of completion and signing up to be a ZIN (Zumba Instructor Network) member. Now I will work towards preparing to teach my first class. The Zumba training definitely made me smile. Not only did I enjoy the dancing in the training, but the instructor was funny. I am sure I will do more courses with them as I would love to be able to teach children. congratulations, colline. that is so great. what a wonderful job that would be. i have never taken a class, though it looks so fun and i’m sure it’s a great workout, always worried i wouldn’t be doing it right. guess i just have to bite the bullet and give it a try, even if i’m not on par with the veterans. That is what is so great about Zumba classes. You don’t have to worry about getting it right – you just have to have fun with it and move to the best of your ability. Thanks Michelle. I am now currently working on my playlist then I will start learning choreography. Thank you Trent. I do enjoy doing the classes very much and want to use my knowledge to bring joy to others. Have you recently moved to colder climes? Nope it’s temps we haven’t seen in southern MN in at least 20 years! I have been attending classes for three years and decided to take it to the next level. I used to teach spinning classes at the gym, Colline. I also enjoyed this for a number of years. I am sure you will easily get into the teaching. Thank you Robbie. That is encouraging. I have never taken a Zumba class, but this sounds awesome!! Congratulations and best of luck teaching your fist class!! Congratulations, I loved Zumba, I love dancing…. It was a bit fast at the end, so I am just doing freestyle and tap. I love the great music in Zumba too!